Britain could lose its European Union veto on some issues as compensation for the concessions Prime Minister David Cameron has demanded, a senior German MEP has said. Weber’s comments come as a German newspaper praised the UK PM’s push for EU reform, stating Cameron will get the changes he needs to win an “in-out” referendum on the union. A recent survey by US think tank, meanwhile, found that 55 percent of Britons support remaining in the EU, as opposed to 36 percent who want the UK to leave. Cameron met with several European leaders, including Weber, last week in a two-day charm offensive on the continent in a bid to gain support for his demands. The PM wants several concessions from his European counterparts before the UK holds a popular vote on membership of the EU by the end of 2017. Cameron wants the power to stop unemployed European migrants from claiming benefits in the UK, a move he hopes will appease hardline Eurosceptics in the Conservative party and the UK Independence Party (UKIP). 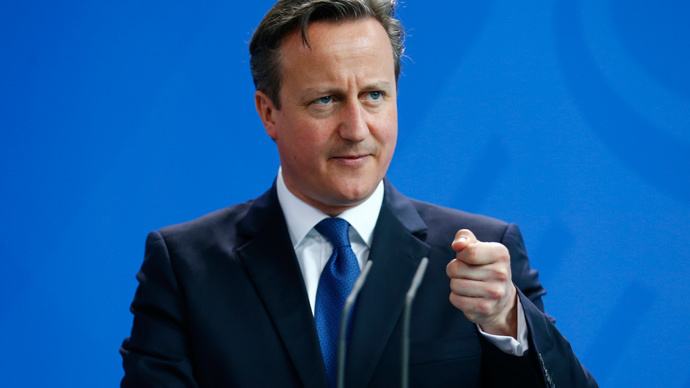 The PM also wants special protections in EU law for Britain’s financial industry. Chancellor George Osborne has been an outspoken critic of EU attempts to bring in stronger financial regulations. Weber, head of the center-right European People’s Party, said Britain must offer “compensation” for any concessions from the EU. “The logic behind [this is] if I insist on getting out of this ever closer union approach than I cannot have the right in the future to block others if they want an ever closer union,” he added. Die Welt said the PM will get the reforms he needs to win a referendum on EU membership while at the same time benefiting the entire union. Alan Posener, a political commentator, praised Cameron for pushing the EU to become less centralized and more diverse. He said the PM’s call for an end to the principle of an “ever closer union,” a phrase written into European treaties since 1957, has struck a chord with many who believe the EU has enough power. “Cameron has actually already won. He will get a number of concessions, in the best case reforms that benefit the entire EU, in the worst case exemptions for Great Britain,” Posener wrote. A recent survey by an American think tank showed that 55 percent of Britons want to remain in the EU, while 36 percent want to leave. The study by the Pew Research Center found support for staying in the EU has grown steadily since 2013, when the public was evenly split on the question. The results will be welcome news to big business in the UK, which is concerned that a “Brexit” would cut Britain off from its largest trading partner. Germany and Ireland have expressed opposition to a British exit from the EU on the grounds it would isolate the UK. The Pew survey found support for Brussels has been increasing across Europe. In a survey of six nations – France, Germany, Italy, Poland, Spain and the UK – an average of 61 percent said they have a favorable opinion of the EU, a 9 percent increase on 2013.